Note: If your proposal is selected, your annual membership fee will be waived for the year. You will still need to pay the registration fee for the CME conference. A full refund minus a $50 administrative fee will be made if registration is cancelled before October 5, 2018. No refunds after October 5. Join us in Atlanta on November 2-3, 2018 at the Hyatt Regency Atlanta! 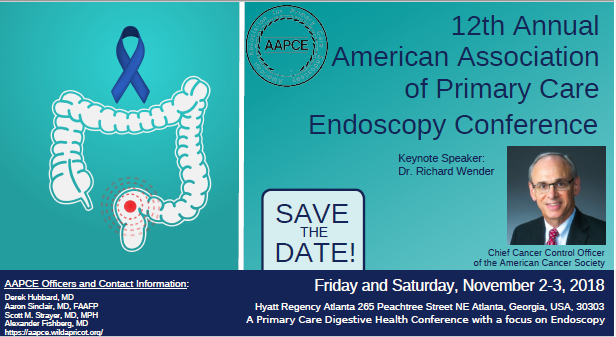 Earn up to 11 Prescribed Credits while learning from some of the most advanced physicians in primary care endoscopy. Please make a reservation before October 10 to ensure receiving the conference rate! Reservations can also be made by calling 1-888-421-1442. Also, Early Bird Registration Discount deadline is October 22! Don't Delay!